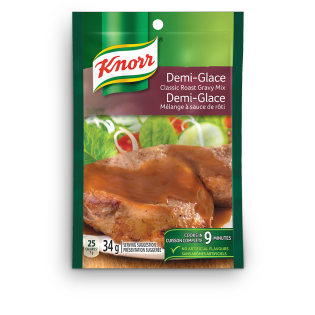 A versatile gravy richly flavoured with beef stock and a hint of wine. Pairs perfectly with roast beef, steaks and veal. Wheat flour, corn starch, natural flavour, sugar, beef fat, salt, tomato powder, hydrolyzed soy/corn/wheat protein, monosodium glutamate, white wine solids, maltodextrin, onion powder, colour, guar gum, citric acid, spice, yeast extract, disodium guanylate, disodium inosinate, silicon dioxide and sulphites. May contain traces of milk ingredients. 1. In saucepan, whisk package contents into 1 ¼ cups (300 mL) cold water until blended. 2. Whisking constantly, bring to boil over medium-high heat. Reduce heat and simmer 3 minutes, whisking occasionally. Makes 1 ¼ cups (300 mL) gravy.